The world's output of metals during the 100 year period of 1863-1963 was greater than in all the previous years of man's history. In the nineteenth century the only metals available to industry were cast and wrought iron and a few non-ferrous metals and their alloys; by the latter part of the twentieth century, steel and aluminum dominated the world, and metals that were mere laboratory curiosities provided the basis for the technology of nuclear energy and space travel. 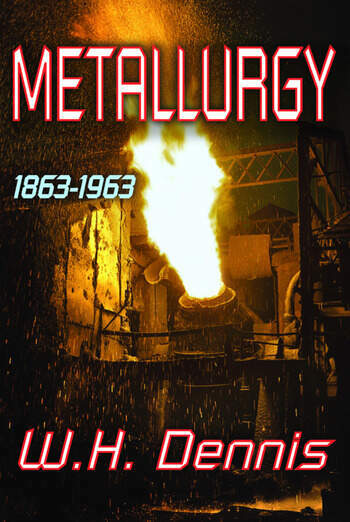 This book records the extraordinary history of metallurgical progress, in which metal art was replaced by metal science. It remains a classic work on the subject. The book begins with an introductory chapter that surveys the entire field to be covered, and follows with eight chapters each dealing with progress in one of the major branches of the metallurgical industry: ore dressing, pyrometallurgy, iron and steel, the major non-ferrous metals, new metals (such as uranium, germanium and cobalt), precious metals, the shaping of metals, and metallography. The book reviews developments in all countries, but American practice - which led the world - is given special prominence. A glossary of metallurgical terms and full name and subject indexes are included. The book is a basic reference work as well as an absorbing history of an important aspect of man's technological progress.